This category would highlight the places regarding the Muslim world. Insya Allah, it would include seerah, Islamic stories, Islamic History or inspiring stories. It should also include maps and general description of the place. Made a little fact book about Makkah with the children. Insya Allah, this is to recap what we have talked about all these while. Here are some scanned pictures of their work. Each of them have their own fact book. Well except Z who is running around all the time with the exception of when we were looking at the maps to identify saudi arabia and Makkah. 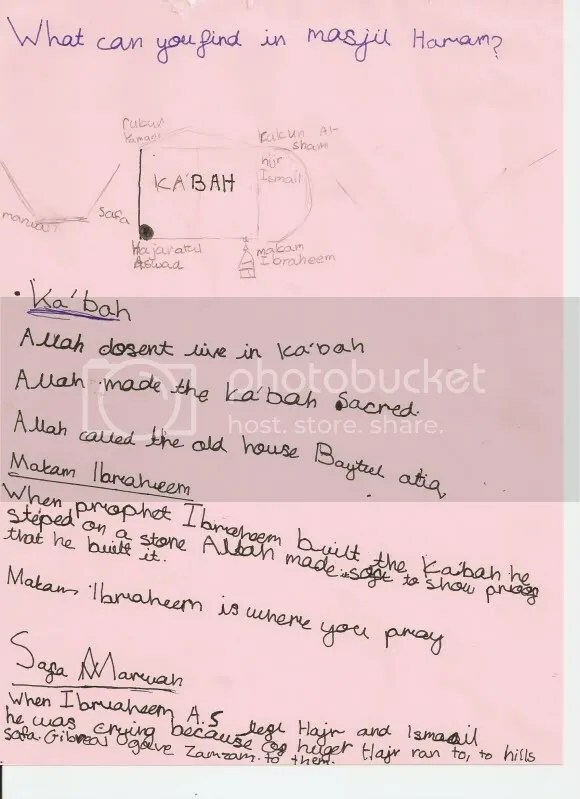 But he made a fabulous cover page of his fact book on Makkah. In my opinion that is. It looks a bit strange and confusing. But I love his idea. He wrote Makkah in arabic font with the background of mountains (he said it’s mountain. They are mountain of Makkah). I love his observation of Makkah. Surprisingly none of them drew Kaabah per se. 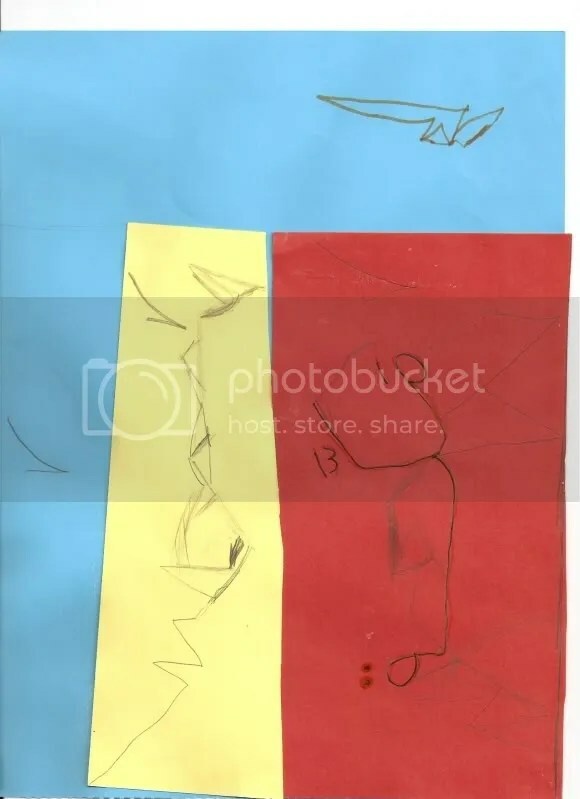 I am putting S’s cover page and Z’s. Anyway, here are the points in the fact book. 1. Which country is Makkah in? 2. Why is Makkah so important to the Muslims? – the most beloved land to Allah and His Messenger s.a.w. And this (the Qur’ân) is a blessed Book which We have sent down, confirming (the revelations) which came before it, so that you may warn the Mother of Towns (i.e. Makkah) and all those around it. Those who believe in the Hereafter believe in it (the Qur’ân), and they are constant in guarding their Salât (prayers). – prayer in Haram is multiplied many more times than in anywhere else. – the reward in praying in Masjidin Nabawi is 1000 prayers. Allah’s Messenger (may peace be upon him) said: There will be no land which would not be covered by the Dajjal but Mecca and Medina, and there would no passage out of the passages leading to them which would not be guarded by angels arranged in rows. Then he (the Dajjal) would appear in a barren place adjacent to Medina and it would rock three times that every unbeliever and hypocrite would get out of it towards him. – However the kafiruns and munafiquns will not be save in Makkah and Madinah as dajjal will shake the earth three times, and the kafirun and munafiqun will go towards Dajjal. They will also be enticed with Dajjal’s temptation. – The three superior mosques are Masjidil haram, Masjidil Nabawi and Masjidil Al Aqsa. – The angels will guard all passageways into Makkah and madinah- The three superior mosques are Masjidil haram, Masjidil Nabawi and Masjidil Al Aqsa. Talk about when Allah instructed Prophet Ibrahim a.s. to build Kaabah. 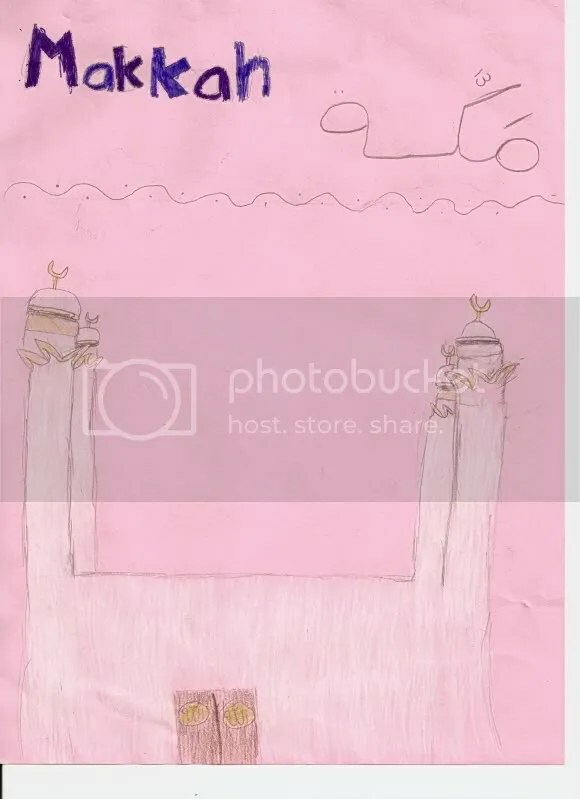 Prophet Ibrahim a.s. build Kaabah with his son Prophet Ismail a.s. The spot of Kaabah has been made sacred by Allah ever since earth and heaven are created. Kaabah is a symbol of worship. 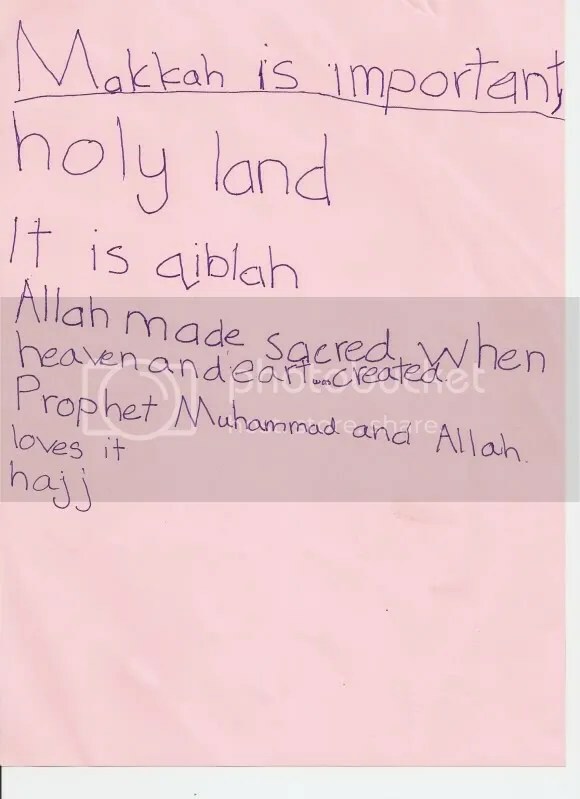 A place made holy by Allah. So we pray towards it, not to it. When we went for the umrah, the kids saw some people kissing the Maqam Ibrahim. I took the opportunity that this is not the right thing to do. Unlike the black stone, Rasullullah s.a.w. never kiss the Maqam Ibrahim. And even the stone has no power to help us, which is kissed by the Prophet s.a.ww, what more Maqam Ibrahim which is not kissed by the Prophet s.a.w..
May Allah guide all of us on the straight path. To know the virtue of the stone, it is sufficient to know that it was touched by the hand of the Prophet s.a.w and also kissed by him. Prophet Ibrahim a.s. built the Kaabah with this stone. The stone signifies the start of tawaf around kaabah. It does not have any power whatsoever. I told the story of Siti Hajar and Prophet Ismael a.s. being left in the desert of Makkah. And how Prophet Ismael a.s. cried. And Siti Hajar ran from Safa to Marwah for seven times and she saw an angel scraping the ground and water came out. This is zamzam. 1. History of Makkah – Prepared by a group of scholars under the supervision of Sheikh Safiur Rahman Mubarakpuri. Translated by Nasiruddin al Khattab. Published by darussalam.